Thought I'd post a quick update on my progress on the large crates that I bought from TT Combat with the little hobby time I have had. 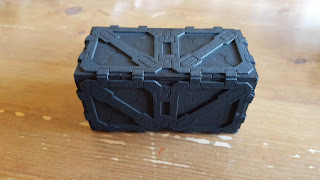 For my review of TT Combat's kit check out the 2 posts - Part 1 and Part 2. 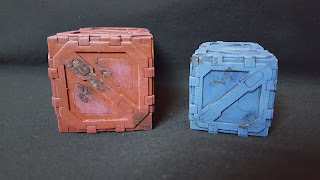 I want to get a bunch of these containers and so I decided to use these 2 as my pilots to find the simplest and most effective way of painting them in a short space of time. 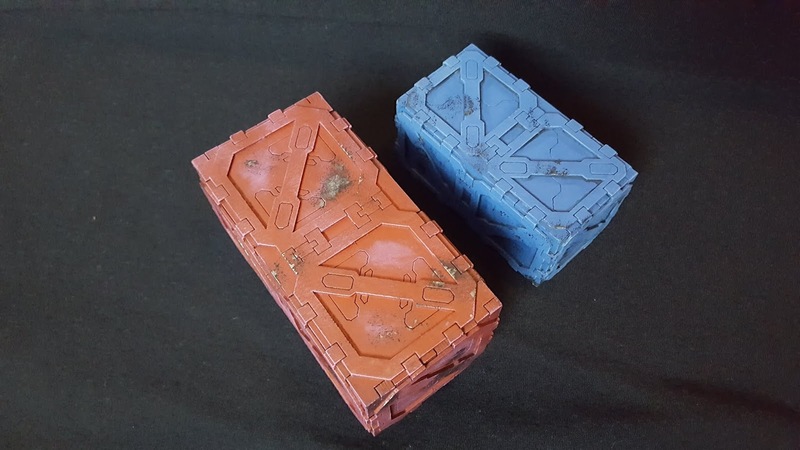 I thought that I would paint the large crate red as a base as I have a Dragon Red army painter spray can and the small crate blue as I would have to brush paint it. I used Chaos black spray to prime the wood and I was surprised that 1 coat was fine for coverage as I had read a lot about lasercut wood soaking up the paint but no such problems here. The red base coat went on fine and provided a good base colour too. This was fairly quick with the can so all good so far. The blue paint took a little longer to brush on but not significantly to warrant spending any more money for different coloured spray paints. Also I needed to do 2 thin coats because of streaking but again my tank brush coped perfectly well with the task. In all time difference to base coat each crate was only 5 minutes or so longer with the brush. 1. Carroburg Crimson all over the red crate. This had absolutely no effect at all. 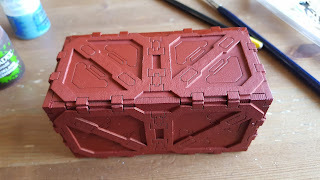 When I've done this on plastic it deepened the red and shaded nicely but on the crate I couldn't tell the difference! 2. Badab Black only in the recessed areas on the blue crate. This wasn't worth doing either as the effect was barely noticeable afterwards. Note to self - don't bother with the wash step next time! As the model looked quite 'flat' I thought I definitely needed to drybrush it to bring the edges up. 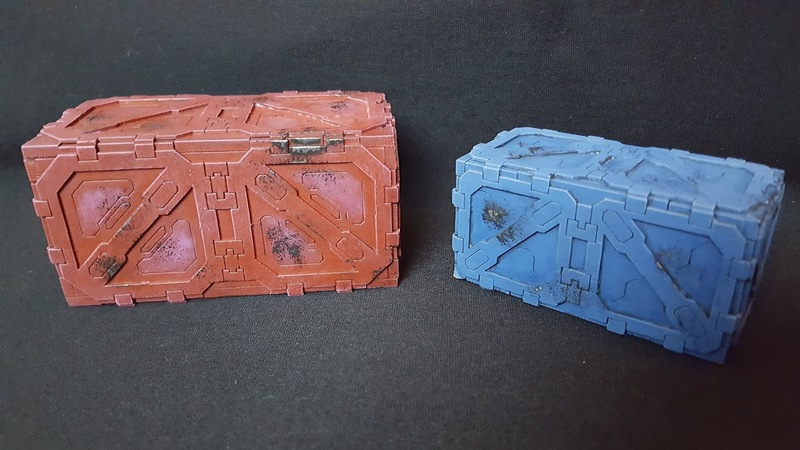 On the red crate I used Emperor's Children Pink and on the blue crate - Ice blue. The drybrushing worked really well and I also drybrushed the flat panels inbetween the raised areas - A little too much on the red crate I think. To make the crates look used I now sponged some chaos black onto various areas around the crates where they have been caught, scratched or battered. 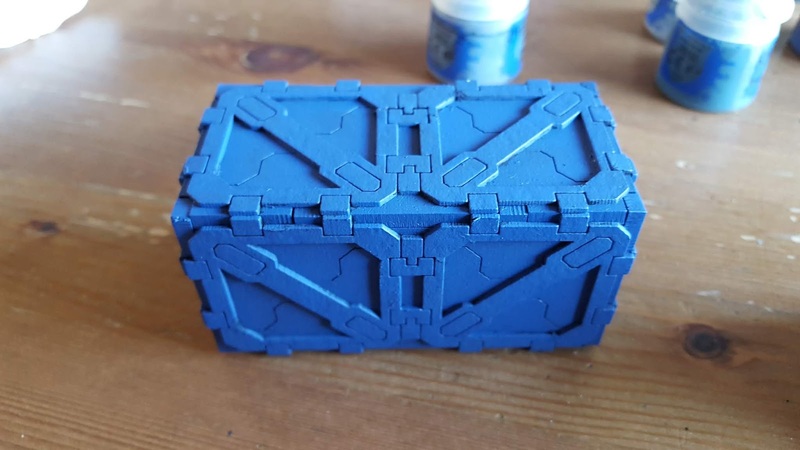 Once the black was on I carefully painted leadbelcher into the centre of the black marks to reveal the metal underneath the coats of paint on the container. 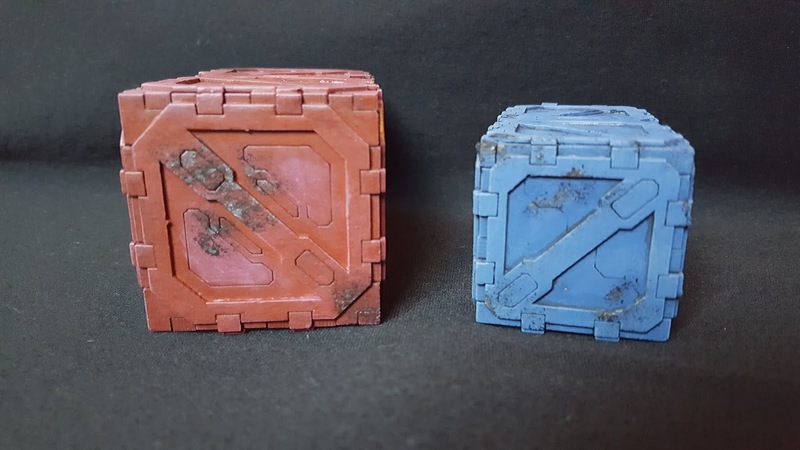 Finally I washed over the weathered areas with Agrax Earthshade. I also made this run over the paint slightly to make it look like water damage is creeping into the paint from the scratched areas. After the last step I got a bit stuck as I liked the way that the containers looked but they were lacking something still. 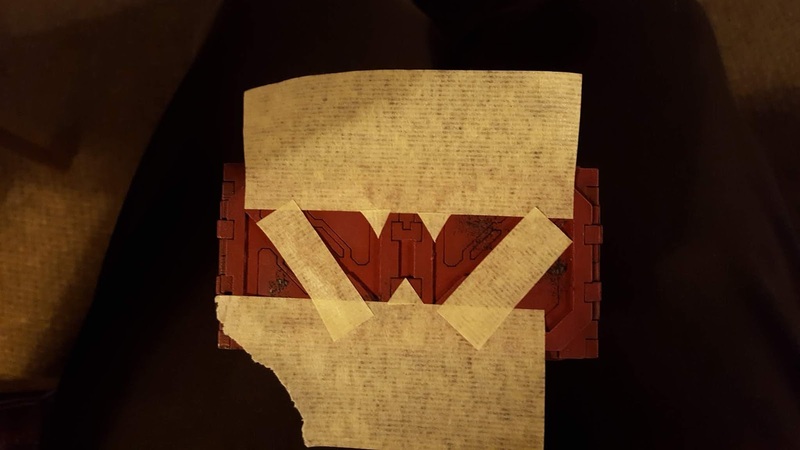 I threw them out onto twitter and Reddit and got a lot of great feedback such as adding graffitti. 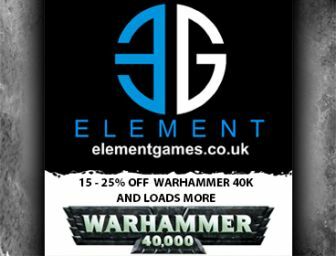 barcodes, dirt, rust, posters and decals. 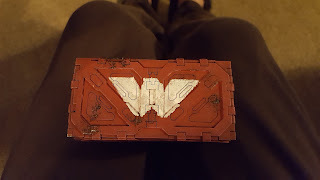 At this point Christmas arrived and I had a long time to thing about things before I finally decided that I would add a Weyland Utani (from Alien) logo to 2 of the sides and then add some dirt/rust and drips. Then I sponged on some White paint very carefully on the first side which came out really well I think. For the second side I tried to do it differently to see what it would look like. Here I sponged on as I did before but then I filled in the recessed gaps with a brush. As you can see they are quite different and I much prefer the first side with the recessed gaps showing. 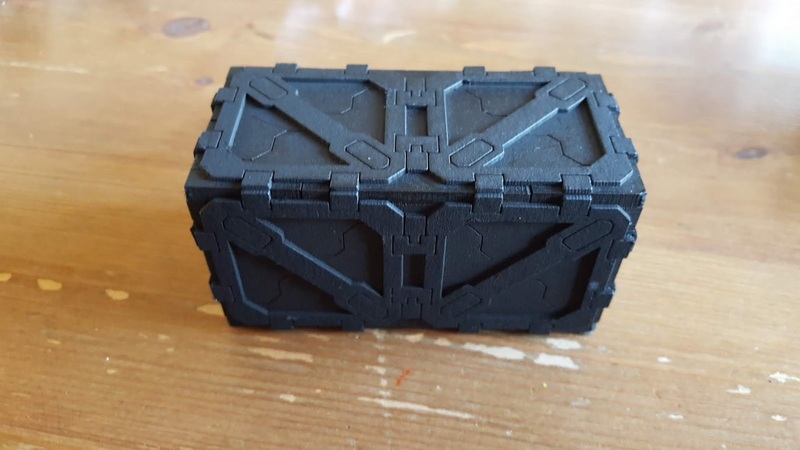 Trying different techniques has been quite fun and I'm pleased with how the crates are coming out. 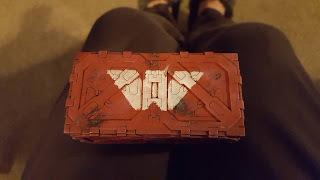 My next step is to paint the red back into the recesses on the one side, weather the white a little and then add some dirt/rust to the crate. As ever I'll be back with more photos so if you have any comments or thoughts please get back to me below.